To revive a dream you have to go back to the place where you first got it. Just like when you’re looking for something you lost. You back track and go back to where you last saw it. To awaken a dream, go back to where you first believed. Where were you, who spoke it and what did they say? What was the wrong you wanted to right? What was the passion born inside of you that refused to take “No” for an answer? Go back there. Relive the moment to revive the dream. Your next step to revive your dream is to let go. Let go of every critical, nagging voice that says, “You didn’t do it then – you won’t do it now.” Unless we let go of the voices from our past we will never see ourselves conquering our dreams in the future. Before you try to pick up your old goals open your hands, and let go of old expectations. If your hands are full of the disappointment of yesterday then there’s no room to carry your dreams into tomorrow. If you want to revive your dreams then the first step is to Go Back. And the next step is to Let Go. The last step in reviving your dream is to get going. Now, it’s time to start typing, start painting, start researching, start moving. The difference in those who do vs those that want to do is the courage to get going. We’re not called to wait for the perfect time or until we have it all figured out. We’re called to go. It’s in the going that we receive what we desire. Ask the 10 Lepers. It’s in the going that we receive our confidence. Ask Moses. It’s in the going that we see our dreams come alive. Ask the Disciples. God is in the going. If you want to revive your dreams then the first step is to Go Back. Next, Let Go. Finally, Get Going. 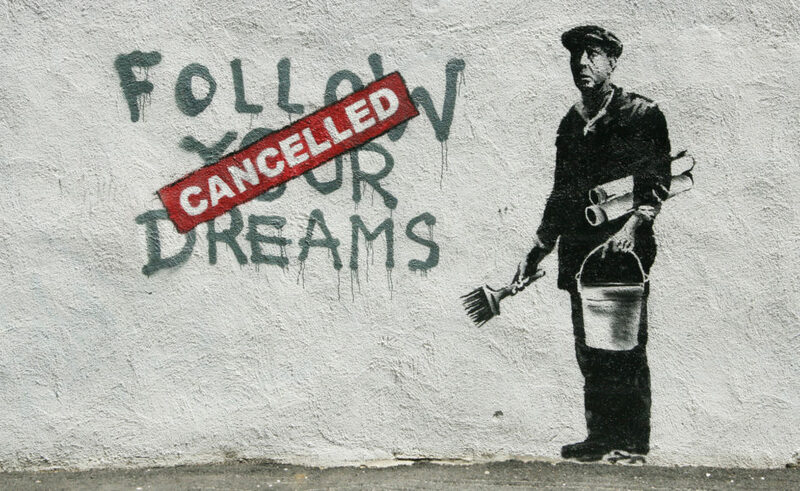 featured photo: “Follow Your Dreams Cancelled” by Banksy.